Discounts Apply: £2 off each on 3 or more! OsteoTrace contains boron plus fifteen other nutrients essential to healthy bones and helpful in the care of osteoarthritis, rheumatoid arthritis and osteoporosis. They are also good for the body as a whole, making OsteoTrace a powerful and cost-effective daily multi-vitamin as well. OsteoTrace was developed by Dr. R. N. after he had identified a conclusive link between (i) low levels of boron in the soil and water of a region and (ii) raised levels of osteo/rheumatoid arthritis in the populations living in that region. Many, many people now use OsteoTrace for arthritis and osteoporosis care, including McTimoney Chiropractor Marianne Woollhead, who introduced it to us, and recommends it to both her patients and fellow therapists. 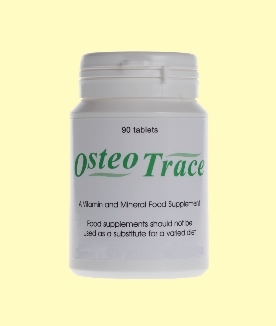 OsteoTrace was formulated by Dr R. N.. His research found persuasive evidence worldwide linking low intake of boron with increased levels of arthritis. I n parts of Australia, for instance, where the drinking water contains high levels of boron (seven parts per million), there is no arthritis in either humans or animals. In Israel, where the soil contains high levels of boron, arthritis runs at 1%. These compare well with the US, which has both low water and low soil boron levels, and an arthritis rate of 20%. 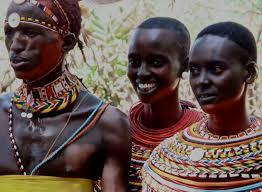 In their tribal lands the Zhosa people of South Africa are blessed with high-boron water. Only 3% of its people suffer from arthritis. When members of the tribe move into the city for work, their arthritis levels quickly rise to those pertaining in the city. Those that return to the tribal lands regain the low risk of arthritis they originally had. Those that developed arthritis in the city see their arthritis diminish of disappear once home. In countries with adequate levels of boron in the soil, like most parts of the UK, the US and Australia, eating good levels of fresh organic vegetables and fruit would provide 2-5 milligrams (mg) of boron a day. The way most of us now eat, and the synthetic chemical fertilisers most of our farmers use, means that the average intake in more industrially developed countries is 1-2mg a day. People living in institutions may get a little as 0.25mg a day. (ii) with 10mcg of vitamin D2 added (a) to compensate for the loss of the Devil's Claw and Horsetail and (b) because adequate concentrations of vitamin D in the blood are essential to bone reuptake of calcium. Vitamin C (Magnesium ascorbate and Calcium ascorbate - 200mg) helps to prevent inflammation at the joints. Calcium (Calcium ascorbate- 83mg) protects against osteoporosis and is essential to optimal bone health. Copper (Copper citrate - 81mcg) helps the body absorb iron from food and turn protein into muscle. It also works with vitamin C to help the body form elastin, an important part of connective tissues, and promotes healing in general. Magnesium (Magnesium ascorbate - 12mg) helps disperse calcium throughout the body Inadequate levels of magnesium leads to low calcium levels. Molybdenum (Sodium molybdate - 25mcg) helps the body absorb nutrients, remove toxins, and is essential for normal sexual function. Phosphorus (di Calcium phosphate - 68.6mg) works with zinc to help maintain bones and teeth. Selenium (L-Selenomethionine - 30mcg) is a powerful anti-oxidant which helps maintain tissue elasticity and slows the ageing process. Zinc (Zinc citrate - 5mg) is key to many body functions, including physical development and growth, wound healing and good enzyme functioning. Kelp (7.5mg) is a good source of iodine, calcium, magnesium, potassium and sodium and other trace nutrients. Each tablet also contains a little cellulose, maltodrexin, silica and protein coating: The maltodextrin is maize-based and therefore gluten free. The protein coating is made from zein, which is made from maize gluten meal which, despite its name, contains no gluten, i.e. gliadin or glutenin. There is no lactose in the formulation. OsteoTrace is suitable for vegans. It contains no gelatin, gluten, wheat or lactose. In countries with adequate levels of boron in the soil, like most parts of the UK, the US and Australia, eating good levels of fresh organic vegetables and fruit would provide 2-5 milligrams (mg) of boron a day. The way most of us now eat, and the synthetic chemical fertilisers most of our farmers use, means that the average intake in more industrially developed countries is 1-2mg a day. The chemical fertilisers make it more difficult for plants to take up the boron in the soil. We eat too many over-processed foods. Adequate boron levels in the body are important to many body functions, but OSTEO-TRACE has been developed particularly to promote healthy bones and joints. None of the sixteen nutrients in OsteoTrace should react with any medication or drug. They should all be present in the vegetables and fruit we eat. Dr R. N. was in his nineties when he died (in 2008). He took OsteoTrace daily, as a preventive measure, and was completely free of bone and joint problems and hale and hearty until a couple of weeks before his death.